Managed well enough to sort out the new wheels, and since they’re DT Swiss Dicut rims I swapped out the green brake blocks for the specific purple ones. Swapped the cassette over, and I’m nearly good to go, once Ive charged the Di2 battery, and checked the brake block alignment - the blocks had seen some light use on another bike. Managed to get the bleed blocks into the calipers on the Domane build. Shimano seem to have gone overboard with safety circlips and pins, there was another small pin that had to be pushed back to get the blocks in. I've built another fixie, not for me this time. In fact, I can't even ride it because it has a 24 1/2" frame (the soon-to-be owner is 6'3"). It looks really fast; 700c wheels look tiny on such a big frame. Eclipse frame. Accounts vary as to whether they were built by Orbit or Holdsworthy. 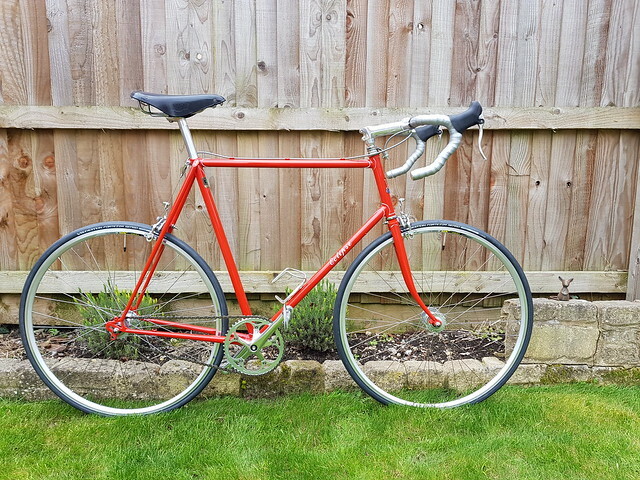 Having a bare 1982 Holdsworth frame to compare it to, this one is Holdsworthy; the details are identical and frame numbering is in the Holdsworth 1980s series, making this a 1983 frame. Someone paid a fortune to have this re-enamelled and lined and then never built it up. Very nice - do you have a shot of the headbadge? And what size is the seatpin? My Eclipse was ratty and blue with different decals when I got it, but H Lloyd didn't have any Eclipse at all when I looked. Not sure whether mine was an Orbit or Holdsworth (plain top eyes on the seatstays), but it rides beautifully. New chain & cassette on the Domane. Took the glossy but rattly and scrapey "Zeppelin" mudguards off the Sequoia and replaced them with dull but non-rattly ones with decent clearance. Replaced the bar tape and chain, and cleaned the oily bits, on the TC. 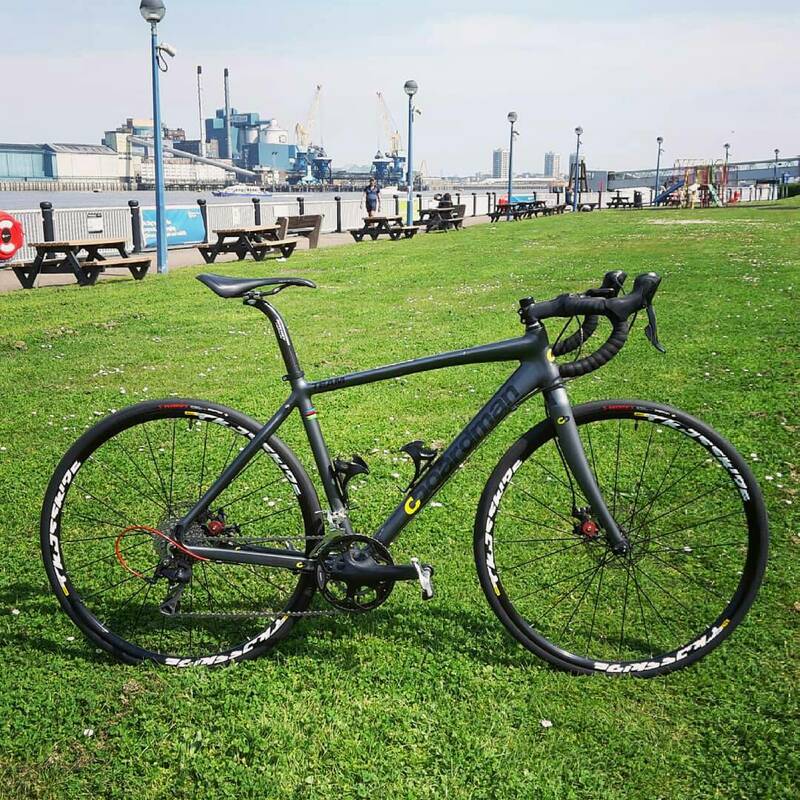 It's the cycling equivalent of a Ford Focus, no image whatsoever. It has an inherent problem: the rear mech is nowhere near the spokes in the largest sprocket yet that's unusable when cranking uphill because I can hear it pinging off them. Either the frame or the rear wheel is as stiff as wet spaghetti. I might borrow Sam's Ksyrium to see if it's any different, and build a new rear wheel with a lot of spokes if it is the wheel at fault. DT don't lace their wheels the right way round for maximum rear mech clearance under load. It didn't have a headbadge! I just stuck a repro Holdsworth badge on there because it looked wrong without one. Seatpin is 27.2. Managed to get some Zumba tunes off a memory stick, onto a iMac, then into iTunes, then shared with the iPad, then playing through the Sonos in the lounge. My wife is happy with the result. 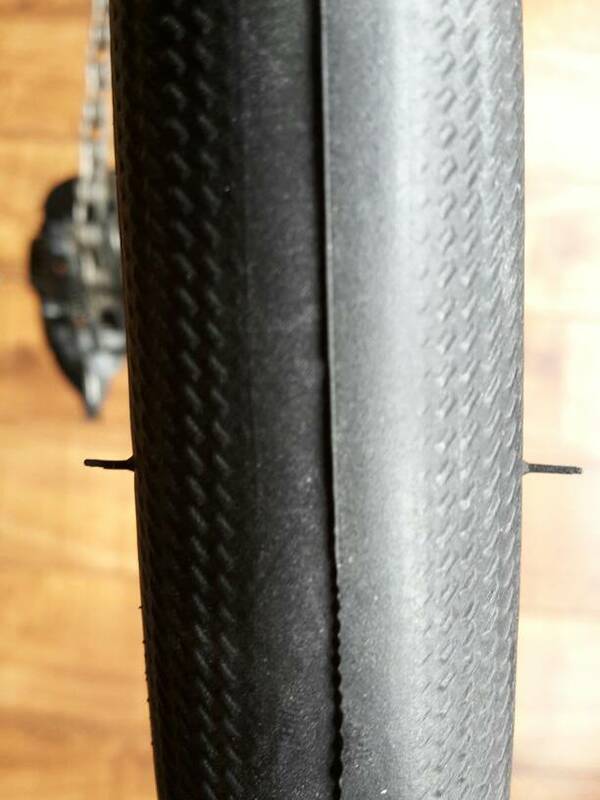 After taking a slice out of my knee and finishing my ride with blood down my shin for the second time in a week, I finally got round to filing the sharp edges of the mudguard stays on my Genesis. A CAIK, of the fruit variety, for consumption this weekend. 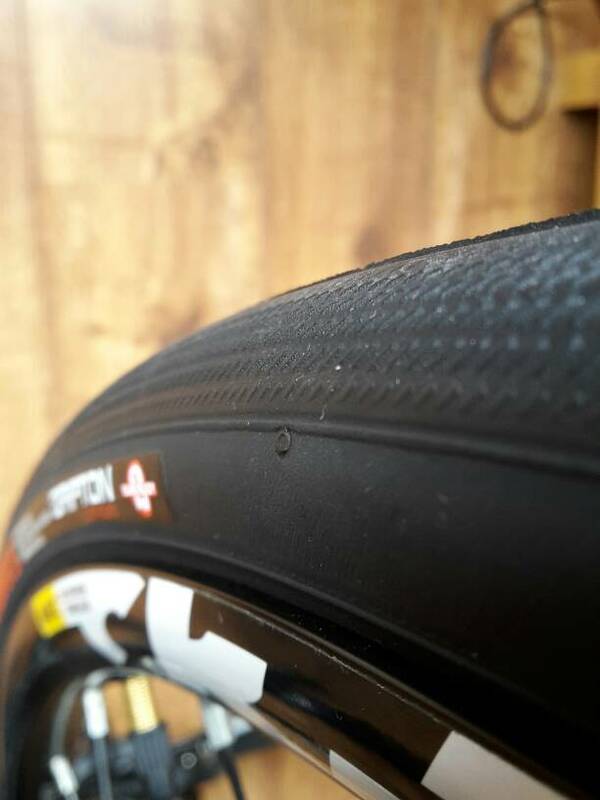 Managed to get a 25mm tyre onto the back wheel of the Ti Carthorse without letting the air out(!) Hope I don't have to do it on the road. Fitted a rather unusual (and not cheap) Reynolds Hidaluminium lamp bracket to the "new" fork* of the Holdsworth Tornado. 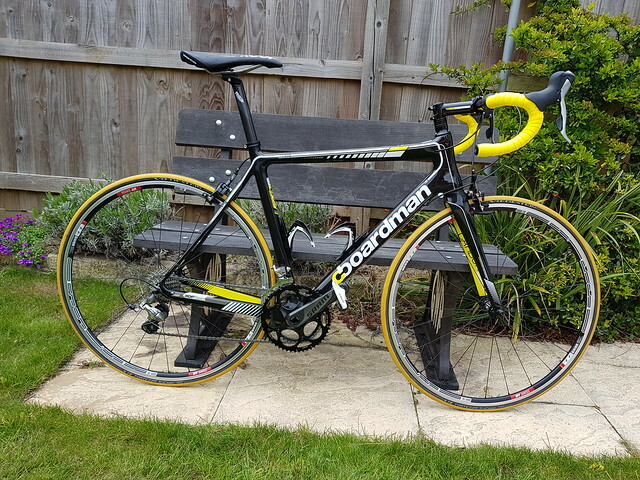 *a s/h fork sprayed and lined to.match the frame - the original Holdsworth fork is too flexible for my uphill wrestling and the front brake rubbed insufferably. Finally sorted out the drivetrain on the Holdsworth. The ring was on the inside of the spider, which was eating away at my soul. I fitted a shorter BB and also swapped the ring from a 3/32" 42T to a 1/8" 41T, which gives an exact 60" middle gear with the AM hub. You try finding a 1/8" 41T in 110 BCD! Then I took out the threaded driver from the hub and popped out the bearing and dustcap ready for swapping to the 12-spline driver. Except...the 12-spline driver can't get as wide a chainline as the threaded one, so I gave up on that idea. I did swap the 3/32" 18T sprocket for a 1/8" EAI 18T. This isn't too hard to do once the driver is out of the hub. Put the bearing and dustcap back in and then put the driver back into the hub and adjusted it. Next problem - the new 1/8" chain, a rather natty KMC K710SL, is only 100 links and I needed 102, Luckily, I had a bit of unused K710SL hanging around spare from the track bike. I'm sure that chain was longer, since it went around 52 x 17 on the track bike with links to spare. The EAI sprocket sits a bit further out than the old Surly 3/32" sprocket, which helps with chainline but it runs super-close to the RH seatstay. If it ever actually rubs, I'll put a 1mm washer under both hub locknuts. This is my fault for reducing the AM hub width to the bare minimum (111mm!) because it looks cool. Householdy stuff mainly. Cleaned and vacuumed out the grate, noting it’ll need attention with fire cement before next burn season, and mixed the ash into the compost. Swapped the settee from its winter position in the middle of the room to its summer position under the window, and swapped the winter rug in front of the fireplace for the summer one. Vacuumed lounge, stairs and upstairs landing and bathroom. Cleaned the “summer” spare from the car after fitting the refurbished wheel with new tyre that was needed after I trashed the previous tyre against a raised manhole. Once cleaned, it was sealed and stored back in the shed. Only bike related fettle so far was to swap out the passing valve core on a wheel prior to going out for a ride this afternoon. Shoved a bit of wood under the back feet of my backup keyboard to try and improve the typing experience. Still don't like it. A non QR seat clamp, as the old one had a gradual slip; and a fork mounted light, as my bar bag blocks all bar mounted lights. Fitted a new freehub and cassette to my Moulton's rear wheel. Cleaned and regreased the front suspension on HK's Moulton, so squeak banished. Dug out spare tyres for both. Swapped various Rivet saddles between my fixed, Frezoni, Moulton and the audax tandem (mostly Pearl Pass but adding an Independence Pass), taking off the last time-expired B17 Std in the process. Found that a Pearl Pass was starting to delaminate (hence the shape change) and accordingly contacted Carradice. Checked over the audax tandem and cleaned the chains, ready for tomorrow's 200. Fitted the tandem roofrack to the car and the tandem to the rack. Started building up the Colnago I got from bikenerrd. I’m ridiculously excited. Got both engines running on my r/c Partenavia P68 twin, after about a year in storage. I was supposed to fly it today, with its new wing, but the gremlins got in the way and I put it on the to-do list until I'd walked the dog and had a snooze in the sun. By which time it was too late to go flying. But both engines now run and have been fully tuned. So they are ready to fly. Well, that rather knocks my bottom bracket fettling into a cocked hat! barbecues yesterday for later today. Adjusted front derailleur outer limit screw, removed old finish line sealant and inserted new Stan's race sealant. Fitted frame bag and saddle bag.